We are in an era of the "youth movement" in conducting, witness the ascent of wunderkinder the likes of Gustavo Dudamel, Yannick Nezet-Seguin and Philippe Jordan, just to name a few. Yet, conductors are like fine wine - they get better with age, or if they are great to begin with, the best ones have staying power. This is certainly true with Spaniard Rafael Fruhbeck de Burgos. 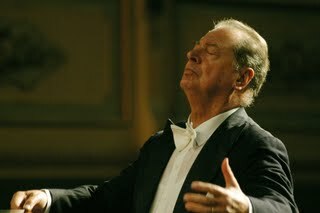 Born in Burgos, Spain in 1933 and trained in Spain and Germany, de Burgos at 76 is an elder statesman among conductors, having led many of the great orchestras of the world, including a stint as the chief conductor of the Montreal Symphony in the pre-Charles Dutoit era. Colourful and flamboyant are oft-used adjectives to describe the conducting style of de Burgos - it seems that he is incapable of making ugly sounds. Among conductors, his fluid and graceful movements make him a joy to watch. Despite the aforementioned youth movement, de Burgos is still around and going strong, his energy and charisma in full display this evening, the first of his two performances with the Toronto Symphony Orchestra. The first half of the evening’s program consisted of two Spanish pieces – Joaquin Turina’s La Oracion del torero, Op. 34, and the famous Concierto de Aranjuez by Rodrigo. Originally composed in 1925 for string quartet, it was later adapted for string orchestra and is one of Turina's most popular pieces. de Burgos gave a masterful reading of the score, bringing out the lush, Debussy-like lyricism of the work. This was followed by arguably the most popular piece of the evening - Concierto de Aranjuez. The appearance of Pepe Romero elicited quite a stir from the large audience. Pepe Romero is of course a member of the legendary Romero family that dominated classical guitar for generations. I recall my undergrad days attending many Angel Romero’s concerts on campus, hearing him play many pieces including the Concierto de Aranjuez. The magical second movement remains one of the most evocative in all of classical repertoire. There is no denying that the large Roy Thomson Hall isn’t an ideal venue for the guitar, an instrument that requires a more intimate space. The soloist was discreetly miked, and de Burgos held down the orchestra for him. A beloved figure, the audience was very supportive of Romero, although I feel that at 66, he has lost a bit of the fleetness in his fingers, more noticeable in the first movement, which came across as rather choppy and tentative. The long second movement with it exquisite lyricism went considerably better. With such wondrous music, it's hard to criticize! The audience clearly loved him and gave him a standing ovation. The centerpiece of the evening was Berlioz's Symphonie Fantastique, which took up all of the second half. This piece is considered by many to be the composer's signature work. It certainly is a staple in the standard repertoire. The composer revised it several times between 1830 and 1855. In the 1855 version, Berlioz was supposedly under the influence of opium, through which he saw visions which inspired the central themes of the work. This massive work with its five moments can be challenging for any conductor, but de Burgos held it together beautifully, bringing out fully the lyricism without sacrificing the intensity inherent in the score. He was rewarded with sustained ovations at the end. All in all, a most enjoyable evening of music-making. The guitar was not miked in the concerto. Great stuff from you, man. Ive read your stuff before and your just too awesome. I love what you’ve got here, love what your saying and the way you say it. You make it entertaining and you still manage to keep it smart. I cant wait to read more from you. this is really a great blog. Guitar is always on the go! Great blog, I enjoyed reading it. I love guitar when i was a kid. Reading this kind of content makes me smile. Thank you for sharing.